Revere Ware Parts :: Amazon :: Fake web store? Plenty of our parts are available on eBay, as we recently mentioned. Most appear to be parts that were likely obtained through us, or through our store front on Amazon.com, and are simply being resold (at a higher price). So we aren’t totally shocked that other people are selling our parts. 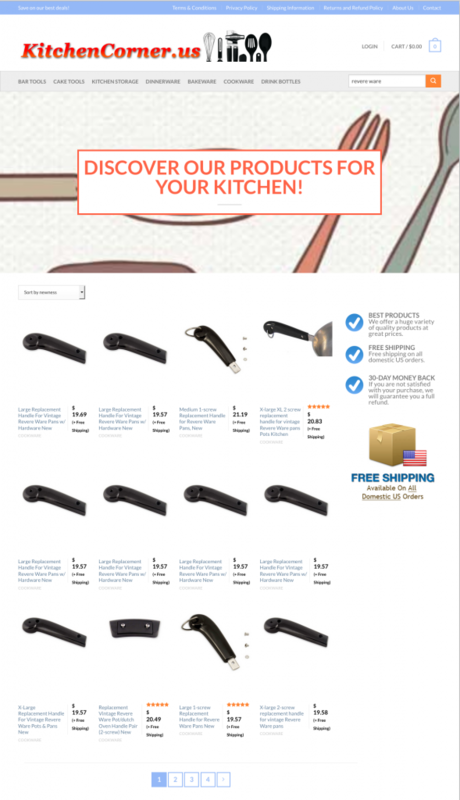 They list a lot of other kitchen related items as well. Given that we don’t currently sell wholesale, and those are clearly our stock pictures, it seems unlikely that they are fulfilling from inventory. That leaves a couple of options. Our first thought is that it is a completely fake store and they will just harvest your credit card number and keep your money. Our second thought is that, it is just a storefront sitting on top of Amazon.com fulfillment. If they simply order the parts through Amazon and have it directly shipped to the end-customer, they don’t have to carry inventory for any of the items they are listing. So far, we haven’t been brave enough to try purchasing something to see if it arrives in an Amazon box. But if someone is willing to try, we’ve love to see what happens. The store looks pretty fake, as do the reviews. It all looks as if someone tried to make it look like a legitimate store, but didn’t quite succeed. Their contact page lists a German address and an emails: [email protected] When I go to the tsc-retail page, it is a fancy presentation with text overlay talking about bringing the world closer together through retail … and the video shorts are of Seattle. Hmm. In any event, just a word of caution: We are the only folks that make these Revere Ware replacement parts presently. We sell them through this site, and on Amazon.com. The items we’ve seen for sale on eBay appear to be legitimate second market items. But I would stay away form any other outlets (and the prices are much higher anyways).